Yoga is an ancient practice that appears in the Indus Valley in the 17th Century BC. There are different types of yoga, the most widespread and known in the West is Hatha Yoga. It is a system of physical postures called asanas, whose purpose is to prepare the body for meditation. This type of yoga emphasizes physical, mental serenity and relaxation, through proper breathing, control of our body and the meditation. Yoga and meditation favor a transformation or personal change that leads to a better quality of life. * At the physiological level, it induces a response of the parasympathetic nervous system. * At the cognitive level, it produces changes in the valuation of stressful situations (primary value) and the capacity to deal with it and the associated potential consequences (secondary assessment). An attitude of objectivity and fairness takes place before the events of life, favouring an attitude of detachment and distance to this events and their results, allowing relative problems and facilitate coping of them. In addition, the practice of yoga develops attention and consciousness about our acts, thoughts and emotions, which allows to detect the physical and mental state of tension to confront it with the available resources. * At the behavioral level, it can contribute to access to internal resources for coping. People learn to control impulses, to relax, to ask for help, to seek information and to develop healthier habits and behaviors. * On the emotional level, improves mood, increases optimism, acceptance and favour emotional regulation. I am María Soledad Martínez Ávila, ICU nurse of the Hospital 12 de Octubre in Madrid. 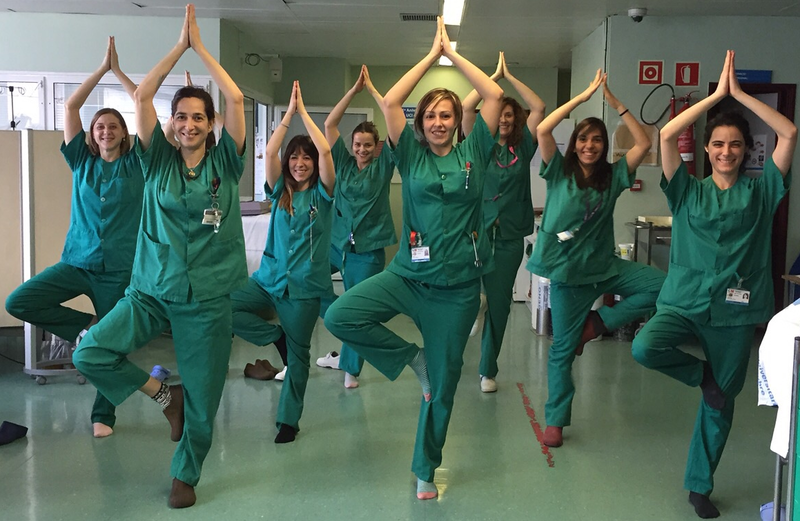 With all these benefits associated, I thought that it would be a good idea to bring yoga and meditation to the hospital, and that my mates could enjoy and feel this awakening of consciousness, which would turn around in our patients, families and work environment. I’ve been practicing yoga for more than three years, and last year I began my training as a teacher of therapy yoga. I am developing a research project in my hospital ICUs. We want to study what effects yoga and meditation have on stress in doctors, nurses and auxiliary nurses. Among other parameters, we intend to carry out two determinations of cortisol in blood, at the beginning of the study and at the end of this. And although the truth is that the project has been well received, I need funding to make the analytical determinations. I am looking for ideas, sponsors or help to carry out the project, so do not hesitate to contact me (marisolmavila@telefonica.net). Thank you for your collaboration!